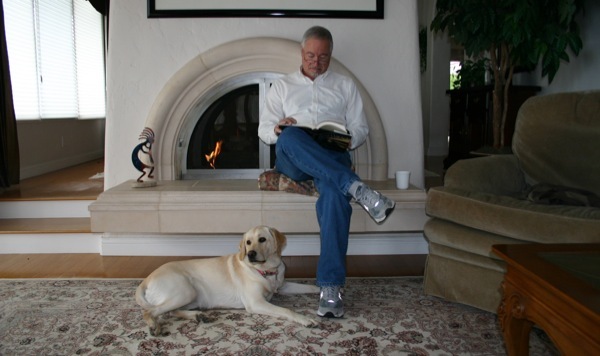 Other than writing novels, I enjoy raising and training assistance dogs for Canine Companions for Independence (CCI). The organization breeds incredible dogs for disabled people, most of who are restricted to wheelchairs. For the past six years, Melayne (my wife) and I have volunteered to raise and train four CCI puppies, each one an absolute joy — extremely smart, unbelievably beautiful dogs, with wonderful temperaments and personalities, all brought together because of the incredible breeding program CCI has developed. All four dogs were Labrador/Golden Retriever mix, which helps bring the energy level of a Labrador down to a manageable level. We pick the puppies up when they are eight-weeks old, and train them over an eighteen-month period in social skills, plus teach them approximately thirty-five commands. We take them everywhere with us: restaurants, hotels, theaters, grocery and department stores, airplanes, trains, boat, busses; anywhere a potential recipient of the service dog (known as a graduate) might require the dog to go. When we return the puppy to CCI they are about two-years-old, and they go into professional training for the next six-months. Less than half the dogs actually make it through professional training. Those that do are assigned to a graduate that they will assist for approximately the next ten years. Training these dogs is a wonderful experience, and one I never envisioned enjoying as much as I do. The question most volunteer trainers are asked is “How can you give the dog up?” It’s definitely difficult, and always tears at your heart. You cry the month before you turn the dog in, and for the month after. But when you see what these service dogs do for their graduates, it definitely makes it all worthwhile. One additional comment. Always ask if you may approach and pet a service dog. Please don’t just reach out to great the dog. It can often be difficult for the person with the service dog to control the dog’s reaction if not properly warned. Thank you.